A new music outreach has been launched this spring. This year St. Tikhon’s Monastery broke new ground for Orthodox choral music in America, creating a new ensemble, the Chamber Choir of St. Tikhon’s Monastery. 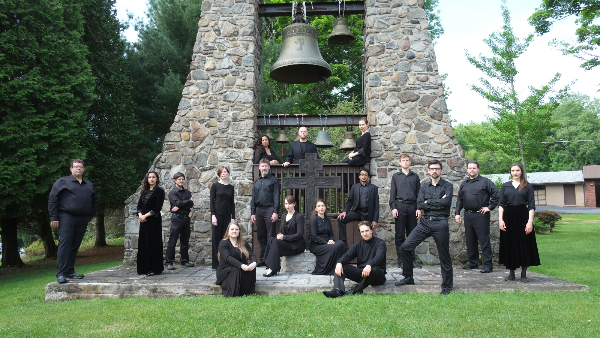 The Chamber Choir of St. Tikhon’s Monastery is an all-professional ensemble, made up of some of the finest singers in the New York area and around the country. Working together with the Monastery’s resident music director, conductor and composer Benedict Sheehan, the Chamber Choir just recorded an album of newly composed and arranged sacred music in the Orthodox tradition. Members include Benedict Sheehan, conductor; Laura Soto-Bayomi, soprano; Tynan Davis, mezzo-soprano; Matthew Slipp, tenor; and John Michael Boyer, baritone. Till Morn Eternal Breaks includes world-premiere recordings of some of Sheehan’s liturgical works, as well as a world-premiere recording of his Triduum Paschalae, a work for mixed chorus and soloists based on medieval English poetry and texts by Gerard Manley Hopkins. The CD will be released this Fall.